It’s funny; I loved it as single plies on the bobbin, hated the 2-ply yarn as I spun, and then fell in love again when I saw the skeins all laid out. I’m not sure what it was about the bobbins of plied yarn, but I very seriously considered stopping, switching to Navajo plying, and calling it a bust. Now, I’m glad that I didn’t. 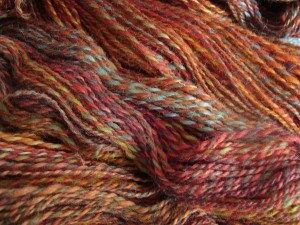 I love the way the colors mix in the skeins. Each strand looks like a different colorway, but somehow they all go together. 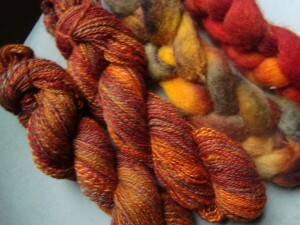 The color mixing reminds me of the yarn for my sunset sweater, which knit up beautifully in the end. I’m excited to see what happens with this…I think it will make for a similarly interesting knit. The only thing missing is yardage. 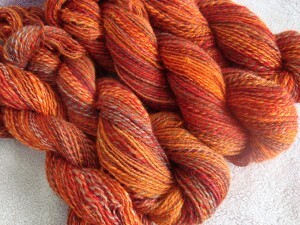 You may remember that I spun 8 oz of Falkland a while back, and ended up with 950 yards. That’s a pretty good yield for 8 oz, but it’s a little shy of what I’d like to knit a sweater, even a lacy one. 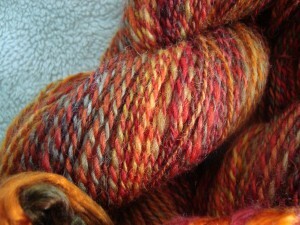 When I dyed the fall colors fiber, I went up to 12 oz of Finn. I figured that should give me 1100-1200 yards, which is much more within my comfort range for a sweater. 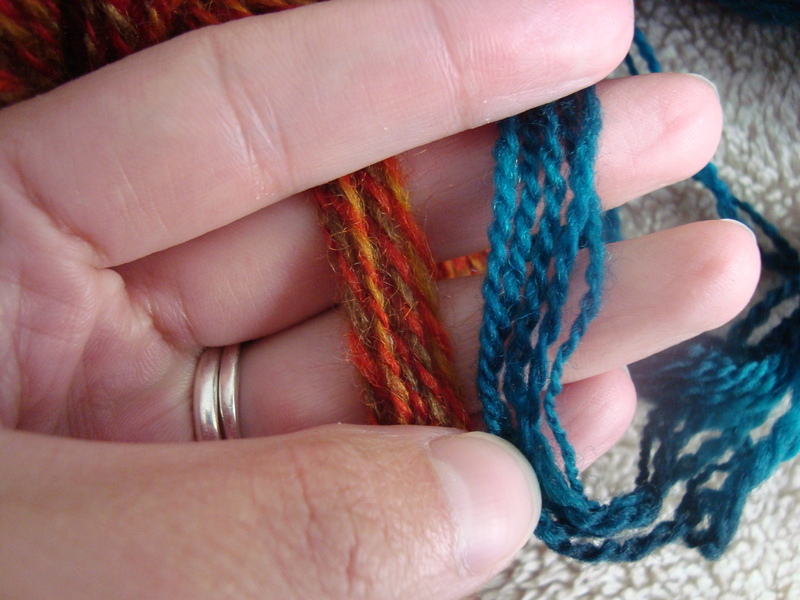 You can see that the two fibers spun up to very much the same weight. 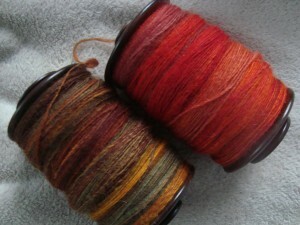 So, I used 50% more fiber, spun it up to the same weight, with roughly the same amount of twist, and what do you know? I got 978 yards from the Finn. That is twenty.eight. yards more than my 8 oz of Falkland. I counted twice. I reweighed the skeins to make sure it was really 12 oz. I walked around the house muttering “28 yards!” to myself all last night. But so it is. It appears that I have run smack dab into the problem of grist. Grist is to spinners what gauge is to knitters, which means that it’s something you don’t really think much about until something really nasty happens and you want something to blame. Well. Grist is a standard way of describing weaving yarns, and it’s usually given in yards per pound. It has to do with the weight of the yarn, the loft of the fiber, the amount of twist and numerous other factors that I’m sure I’m missing. The bottom line is that it tells you the density of the yarn, and the density of the yarn is a very important factor in deciding how many yards you will get from a given weight. It appears that Falkland has a higher grist than Finn. About 50% higher, to be exact. I knew that Falkland was fluffy stuff, but I didn’t realize just how much fluffier it was until last night. I am in even greater awe at the fluffiness of Falkland, because I would never call that Finn a dense or heavy yarn. That mix of colors looks just like the autumn trees around the farm at sunrise…even glows like them. Really nice! And I don’t suppose it would bloom so you could knit it on a larger needle, would it? Is it worth a swatch to see how it behaves after a bath. It would make a lacey sweater, but I can understand how you wanted it for a more solid fabric. The colorplay is enough for the entire show. Not just pretty – try absolutely stunning! I LOVE the way that your color experiment turned out. You captured autumn perfectly in those skeins. That yarn turned out just lovely! You’ve got everything from fall leaves to tree bark. Fingers crossed that it’s enough for a sweater! 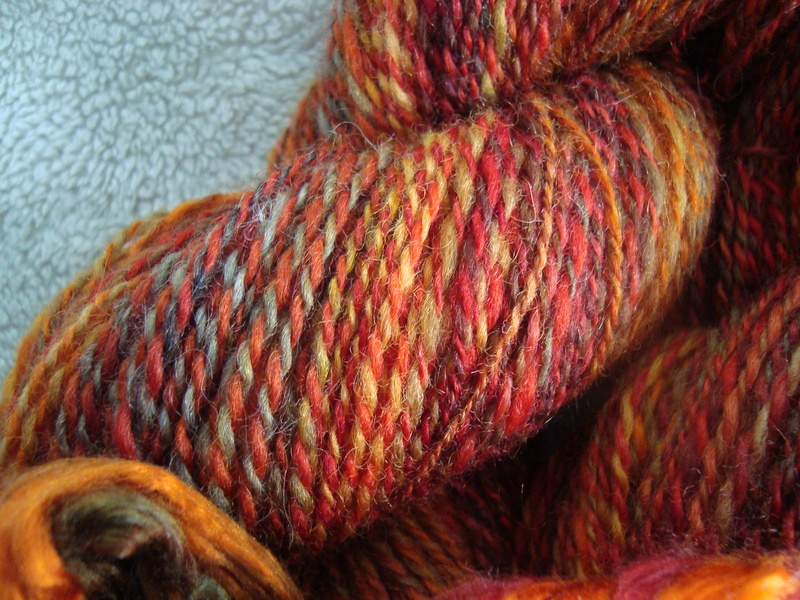 Gorgeous yarns – I’ve been spending time in so many places at the peak of autumn that my brain is saturated with those exact colors. And as for grist malfunctions – I’ve been bitten by it, too. Same fleece, same amount roughly of fiber, and about half the yarn. Hmmmm…. Love the fall colors. Beginning of October we went up north and I was inspired to make a sweater using fall colors as well, except my colors are courtesy of Blackberry Ridge. DesigKnit is powered by	WordPress 4.8.9 . Page generated in 0.292 seconds using 43 queries.